The niche of motor insurance constitutes more than 70% of India's general insurance market. With each passing year new car insurers are making their way into the thriving domain of car insurance. This has made the task of finding the best car-insurer in India a daunting task for those people who have newly bought a car. This article aims to educate car-owners from all walks of life as it discusses about the best car insurance companies in 2016 in India for all categories of cars. In order to pick the best car insurance company it is better to compare insurers in terms of their policies on offer for all types of cars. A car-insurer with great plans for just one category of cars may not be the best choice of car-owners with cars of different categories. So it is wise to find out best provider for each category. Let's start with the first category which belongs to small cars such as Maruti 800. 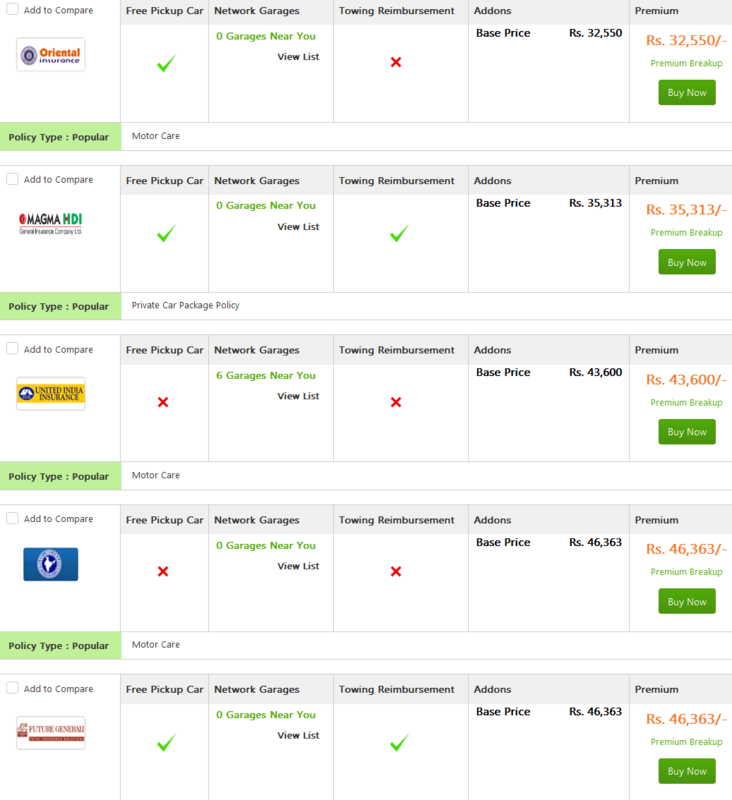 Here are 5 car insurance providers with lowest premium for a small-segment car. The car which is considered to make the comparison is a 5 seater Maruti 800 with 796 cubic capacity. The model variant of the car is AC 4 SPEED and fuel type is petrol. The lowest premium for a comprehensive cover is Rs. 5442 and the provider is Oriental Insurance. The highest premium is on offer by Universal Sompo; a private sector car-insurer and the premium is Rs. 7968. The other three insurers are United India Insurance, New India Assurance and Future Generali in the ascending order of premium. 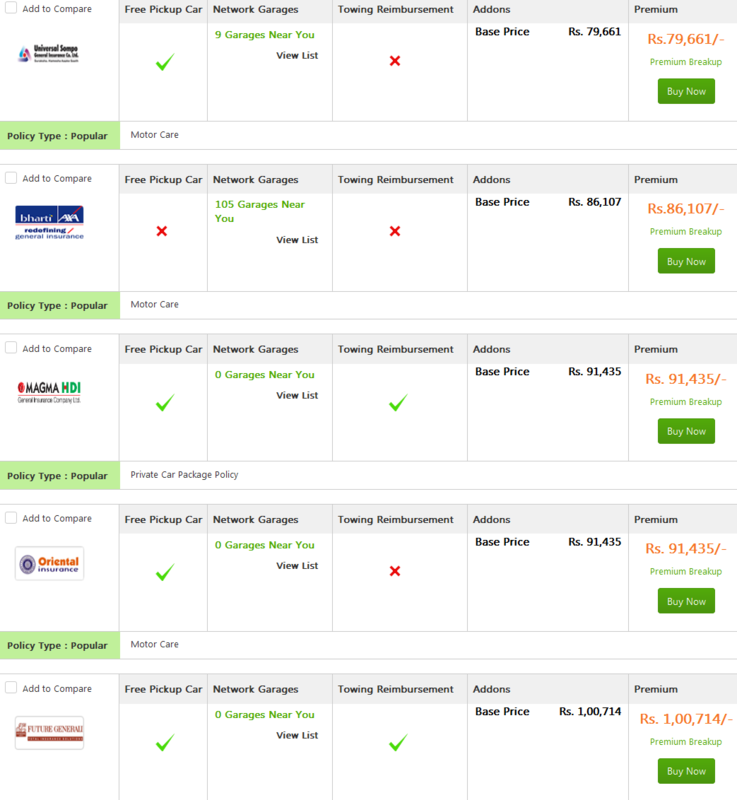 Here are the best 5 car insurers with lowest premium for a car that comes under hatchback segment. The chosen hatchback car to make the comparison is a 5 seater Honda BRIO with 1198 cubic capacity. The model variant of the car is 1.2 E Manual Transmission and fuel type is petrol. The lowest premium is Rs. 8344 which is provided by Oriental Insurance for a hatchback car's comprehensive cover. The highest premium is Rs. 11,333 and it is offered by New India Assurance. The other three insurers are Bharti Axa, Magma HDI, United India Insurance in the ascending order of premium. Here are the best 5 car insurers with lowest premium for a mid-size car. The chosen mid-size car is a 5 seater Honda CITY with 1343 cubic capacity. The model variant is1.3 DX and fuel type is petrol. The lowest premium is Rs. 12,609 and the quote is provided by Oriental Insurance for a mid-size car's comprehensive cover. The highest premium is Rs. 17,967 and it is offered by New India Assurance. The other three insurers are Bharti Axa, Magma HDI, United India Insurance in the ascending order of premium. For a high-end car, here is the list of top 5 motor insurance companies. The chosen high-end car is a 5 seater Skoda Superb with 1968 cubic capacity. The model variant is1.8 TSI and fuel type is petrol. The lowest premium provider is Oriental Insurance and the amount is Rs.32,550. for comprehensive cover of a high-end car. The highest premium is Rs. 46,363 and the insurer is Future Generali. The other three insurers are Magma HDI, United India Insurance and New India Assurance in the ascending order of premium. 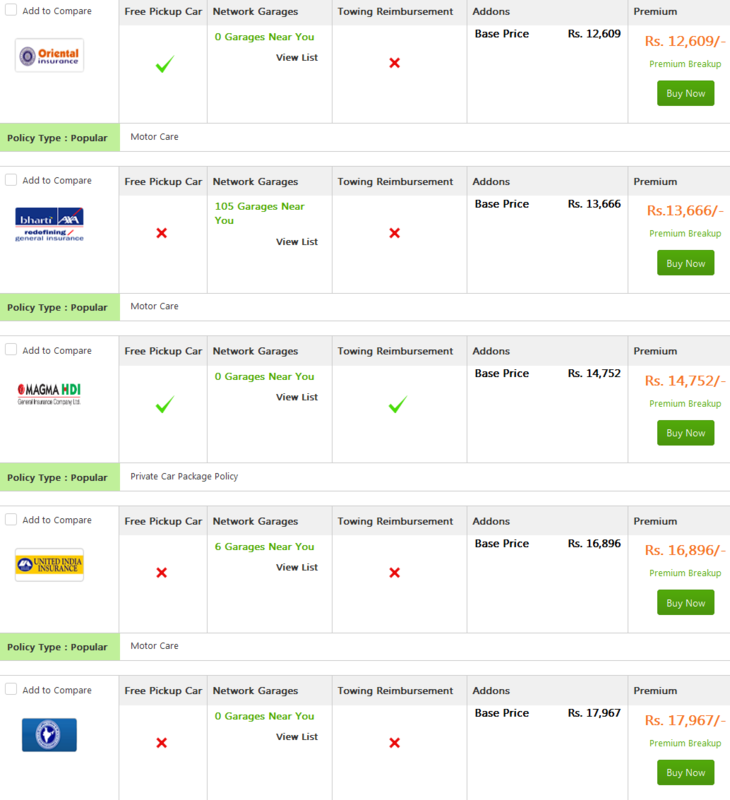 Here is the list of best 5 motor insurance companies for an ultra-high car. The ultra-high car in question is a 5 seater Audi Q7 with 2967 cubic capacity. The model variant is 3.0 TDI and fuel type is petrol. Universal Sompo is the lowest premium provider and the premium amount is Rs.79,661 for insuring a ultra-high car. The highest premium quote of Rs. 1,00,714 is offered by Future Generali. The rest of the three insurers are Bharti Axa, Magma HDI and Oriental Insurance in the ascending order of premium. Now that you know which car-insurers are the best in terms of offering cost-effective policies for all types of cars you need to pick the car insurance plan with best features . Let's take a look at the unique traits of these 5 car-insurers. 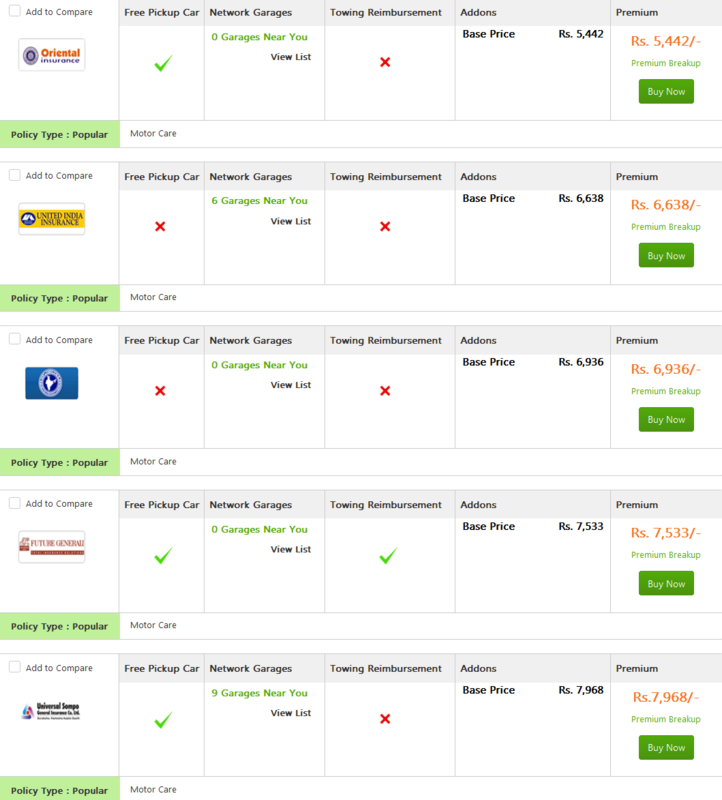 All of these 5 car insurance companies are acclaimed highly by car-owners in India. 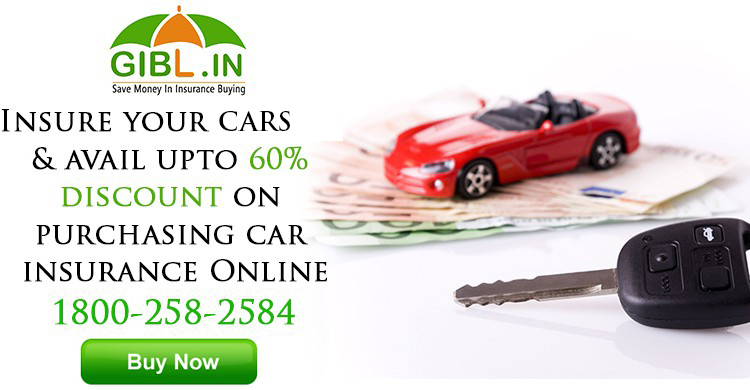 This list of best car insurance companies in India is compiled on the basis of various parameters such as size of cashless garage, customer satisfaction, payment options and special offers. You can select any of these insurers as per your budget and requirement. 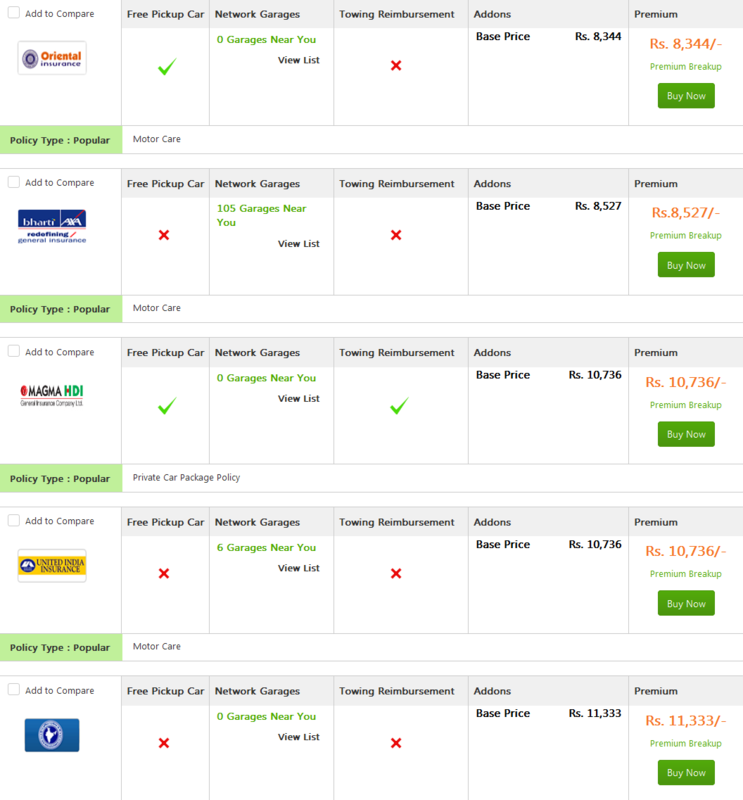 Once you pick one of these car insurance providers and avail the policy don't forget to look carefully through the fine prints. In case you don't understand any policy term you can resort to any insurance consultant for proper clarification. When it comes to comparing, selecting and buying a comprehensive car policy online GIBL.IN is your best bet. At GIBL.IN you can carry out these easy steps effortlessly and make an informed purchase.